Image Guidance is an essential part of thermal ablation procedure. Ultrasonography is easy, available and cheap. Its inherent interactivity makes it the method of choice to position applicators in radiofrequency ablation (RFA). Its ability to monitor thermal ablation is limited because it only provides qualitative information about the ongoing treatment. 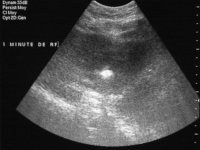 Ultrasonography does not currently provide reliable temperature images in patients. Some ongoing research works aim at providing temperature information with US [1,2]. CT is used mainly when US is not possible. That is when tumors are not visible with US, in heavy patients, or in lungs (RF ablation) or in organs without good acoustic windows. Applicator positioning is quite cumbersome and thermal ablation monitoring is not possible. Treatment validation requires contrast injection and is not very reliable when performed directly after the procedure. CT is often used post treatment, in a three month follow up due to its greater availability than MR.
MR is the best diagnostic imaging modality, with several possible contrast sources. 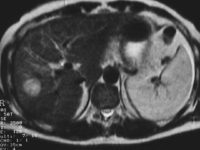 Tumor are usually visible without contrast media with a good conspicuosity. MR overwhelming advantage over other imaging modalities in terms of monitoring of thermal ablation procedures comes from its ability to provide temperature images in real time during the treatment. However applicator positionning under MR is difficult due to a limited access to the patient. So RF ablation under MR guidance is limited to difficult to treat tumors [3,4]. On the other hand, focused ultrasound ablation does not require cumbersome applicator positioning but a rather simple mechanical translation of the transducer to face the tumor. MR is the only imaging modality to date that can visualize the test shot performed before any treatment can take place to garanty the proper positionning of the focal spot. This makes MR the best imaging modality to monitor focused ultrasound ablation. Pernot M, Tanter M, Bercoff J, Waters KR, Fink M. "Temperature estimation using ultrasonic spatial compound imaging." IEEE Transactions on Ultrasonic Ferroelectric Frequency Control 2004;51:606–615. Daniels MJ, Varghese T, Madsen EL, Zagzebski JA. "Non-invasive ultrasound-based temperature imaging for monitoring radiofrequency heating-phantom results." Phys Med Biol. 2007 Aug 1;52(16):4827–43. Cernicanu A, Lepetit-Coiffé M, Viallon M, Terraz S, Becker CD. 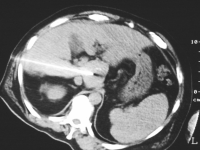 "New horizons in MR-controlled and monitored radiofrequency ablation of liver tumours." Cancer Imaging, 2007 Nov 5;7:160–6.